The majority of my kids clothes are secondhand. We get a decent amount of hand me downs for Isla and none for Connor. 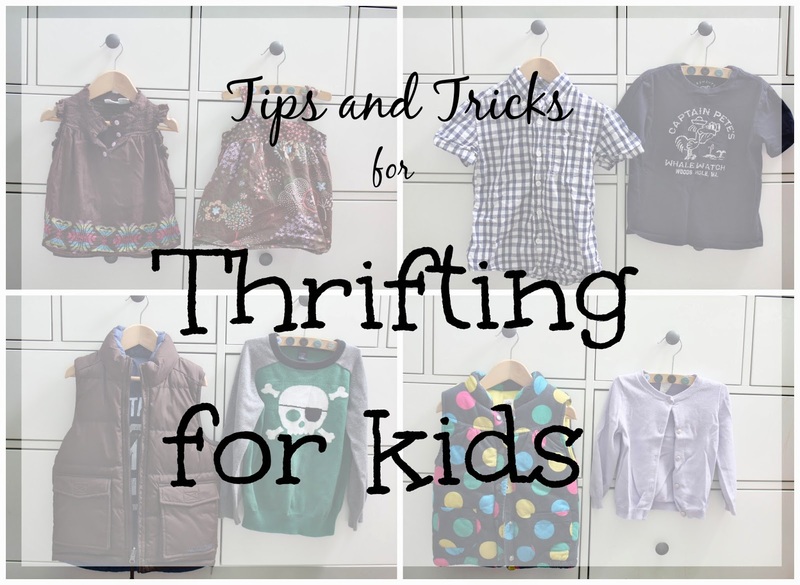 But, after that, I buy almost all my kids clothes from thrift stores. I have been able to score all sorts of brands - Joes Jeans for Isla (for 50 cents!!! ), Janie & Jack, Roxy, Volcom and mall brands like Gap Kids, Old Navy, Gymboree and more are easy to come by. ^^ Both J.Crew Crewcuts. I got the tshirt for 50 cents. Not all thrift stores are created equal. I like ones that are more organized. I am not much for digging through bins of clothing. So, ones that hang all their clothing are the ones for me. Also, you quickly learn the ones that tend to have better quality clothes. Not only do I know the thrift stores I like by me, but I also know the ones that I like by my mom in LA and always hit them up when I go visit. You have to have patience and you really can't be looking for something specific. Some times I walk out with hardly anything (or nothing), other times I hit the mother load. And by mother load, that usually means I spent around $20. Big spender, I know. ^^ These are both bigger clothes for Isla. But the vest looked brand new and set me back $1 and the adorable sweater was J.Crew! 1. Shop out of season. The clothes are much cheaper then. Thrift stores have cycles just like normal stores. Shorts that I paid 75 cents for during the winter are now priced at $3. Just like jeans are currently going for $1-$1.50, but during the winter run $4+. 2. Buy a size (or even two) up. If you are shopping out of season, it just makes sense to size up! I keep a bin in each kid's closet for their next couple sizes up. So when I buy something, I wash it, then throw it into the bin. It makes me so happy to watch the bin grow over time. ^^ I got that Gap vest for $3 and it looks brand new! 3. Check for stains, rips and if all the buttons and zippers work. If the pants have adjustable waistbands, check to make sure the adjustable part is still there. It really does pay to look over each garment when in the store. 4. Thrift stores have sales too. Some use coupons. Other's have specific days where all the clothing is 50% off. Those are (obviously) the best times to shop. Even when thrifting, you can still be picky. By planning ahead and not needing to buy for right now, I can be picky about the clothes I want and even look for specific types and brands of jeans I want. The same goes for other clothing as well. I always, always, always buy jeans, pjs and winter gear when I come across it. These are three things that are hot commodities. I come across jeans often, but, like I said before, I know the styles I like for my kids, so if I come across them, I buy them. I generally never pay more than $2 for an item. Most shirts, I pay $1 or less for, pants usually $1.50 or less and shorts, $1. Pajamas are generally not sold in a set, so you do have to search through all the clothes to find a match. But, if it is a style I like and I find a match, I get them. I haven't had as good of luck with shoes, but have come across good ones a few times. Not enough to count on though. Expect to pay around $2 for a pair of name brand shoes. And, while you are at the store, you may as well browse through the books and toys while you are at it! I have great luck in both those sections too. I have been able to find a lot of Melissa and Doug, just by quickly looking and it is normally priced at $1. Now get out there and get thrifting, then come back and brag to me about what you found! I completely agree with all your tips! I buy awesome shoes for my kids at the local kids consignment store. They aren't as inexpensive as thrift store prices but they're in good shape and still cost about $8 or less (for Vans, Converse, etc.)! Also, I love buy games and puzzles and thrift stores. We've had good luck and all puzzles have had all their pieces. I need to remember to check consignment stores for shoes. Thanks for the tip! As for puzzles, my thrift store will open the package and let me check for all the pieces before buying and there have been a couple times that all the pieces weren't there, so I was glad I checked. I'm also a thrift store mama. We have a local swap and sell facebook site for my city and I often buy and sell there. I bought Alex's entire fall wardrobe for about $25. Now I can just spend on a few special items I want to add to it! An entire wardrobe for $25!?! That's the dream, right?! Now you can go buy a few splurges without even feeling guilty about it!